What is the root of lap steel tonal signatures? Topic: What is the root of lap steel tonal signatures? I'm sort of looking for whatever non-pedal gets closest to pedal steel tone - that thick tone with bell-like quality on the high strings and growl on the lows...I would at least like to understand what the key variables are...pickup? scale length? construction? I've never had the opportunity to play one of the classics (Ric Panda, etc.) and don't know how they get the thicker tone they seem to have also (or am I imagining that, or what is it from?)... (string-through pickup maybe?). That might be close enough to my goal? Anyway, I'd appreciate any guidelines that could help me stop having simply to buy stuff to check it out!! I have a Cougar 10 string non pedal that sounds exactly like a pedal steel. It is basically constructed like a normal pedal steel without the pedals. (I'm selling it on the for sale section if you want to see pictures). I put the Tom Morell tuning on it and it was magic. That pedal steel sound that sounded nothing like a lap steel. To my ear the classic non pedal steel tones come from Rickys, Fenders and Bigsbys. Thicker,bolder,more prominent fundamental and better string separation than a pedal steel. All the ones I've loved had single coils and very solid bridges. If you put a humbucker on a lap or console steel it's gonna sound more like a typical pedal guitar. Asher lap or Remington console is a case in point. Everything contributes. The pickup is the single biggest factor, but the scale length, body material, hardware material and robustness, and the wiring all play a part. Not to mention the pickup height and whatever's on the other end of the cable. So what are the optimal ones for each of those? Scale, pickup, etc.? If there were an optimal value for all of them, we'd all be playing the same instrument! It's all down to taste. Posted 22 Mar 2019 5:18 pm Re: What is the root of lap steel tonal signatures? That is true. The Superslides are very pedal steel like . Speaking of which, I got my hands on a Superslide 12 string from a forum member. Getting it on sunday. You misunderstand my question. I'm looking to gain an understanding of the parameters that generate the different tonal palettes, and their various effects, not trying to identify an "ideal" one. I consider tone perception to be highly subjective. As said above, there are many factors, but I agree it starts with the pick-up. I think sustain and tone are also related to mass and density. Pre-war Rics have both mass and density, and integral bridges and nuts. If the bridge of a guitar is just held down to the top with a couple of screws, the tone will be somewhat limited to what the string can produce, because it is more isolated. Idaho - shot of Jeff Peterson, Ted and Smith Curry "Nothing but the taillights tour"
it's a great question Steve, Noah hit it really on the head in that it is a combination of components, I've spent thirty years and built over 2,000 guitars with a lot of attention always on tone, actually searching to not sound like a pedal steel. I think one factor left out that you have to add is the combination of string gauge and tuning. I've heard the same instrument change radically in tone changing out the pickup (and height is very important), string gauge and tuning. Mass of hardwood, steel nut and saddles with large bridge plates and the long scale all contribute. 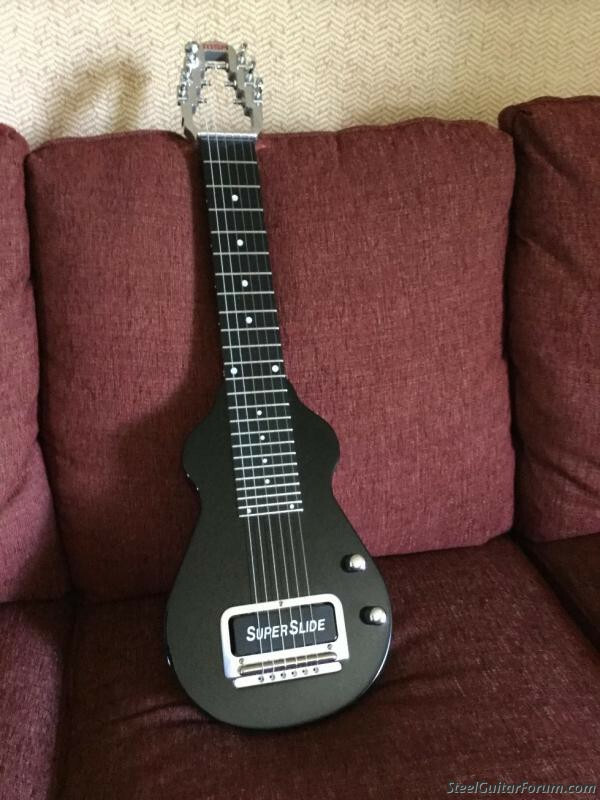 I'd suggest taking a lap steel that sounds "guitarish" to you, change the string gauges, tuning, use the heavy bar and see if those factors start to change it to more of that thick steel sound you are searching for. My 50’s Stringmaster plugged into a Twin can sound very pedal-steelish. No idea what the specific parameters are. Might have something to do with the original dual single-coil pups and how you adjust the blender knob on the axe, but the Silver Face Twin has that mid-scoop in the eq too. I agree with David, I have an 8 string SuperSlide that can sound very pedal-esque. If you would like to get more of a bell-like tone with your existing guitar, try picking the string farther up the neck away from the bridge, you will find some nice tonal sweet spots, especially at the octave position from the fret the bar is on. Hey Steve, I would not classify the Ric I have as pedal-steelish, if that’s how I understand your quest. Of the non pedal guitars I’ve owned, Sierra for sure, and without a doubt, the Remington Steelmaster sound exactly like a typical pedal guitar, and appear to be designed that way. I actually think I'm not needing a perfect pedal steel sound - if I did, I'd probably just go back to playing pedal steel...but I've worked out the classic pedal steel riffs imitating the pedal moves, and chord inversion transitions, to get a steel-ish feel to what I'm doing, which is playing in an alt-country band, where pedal steel is a big thing...so a somewhat "thicker" sound would be all I need. I spoke to MSA today - they used the Ric B6 sound and layout as the model for the Superslide, and its construction looks very similar...they aren't actually making them again yet (had a supply hiccup) but will be shortly...and have about a 4 month wait to get one...(too many pedal steels in the queue first, mostly).